Our first speech camp took place on October 15-18, 2012 at Chiangrai YMCA, Thailand. On the first day, there were 9 stations which focused on collecting patients’ information, pre-testing for basic knowledge about cleft lip and palate, as well as hearing and ear nose and throat (ENT) assessments.In the afternoon, stations were set up to assess speech and language development, oro-facial examination, articulation assessment and speech therapy. Children were encouraged to play at recreation stations facilitated by staff of Chiangrai Special Education Center so that they’d be relaxed before continuing speech therapy. The next 3 days focused on speech therapy, counseling and recreation. Speech language pathologists initiated speech therapy and focused on correcting errors. At the end of this camp, the patients expressed their appreciation by giving jasmine garlands to speech language pathologists, Speech Assistants and resource persons. They also sang a song called “IM-UOON” – a song to express how mothers dearly look after their sons and daughters with high hopes of their future. Speech Assistants will meet their patients once a week in future to facilitate speech exercises as planned for about 30-45 minutes. A family member will help the patient complete the speech exercises on a daily basis. Toys were given to Speech Assistants as facilitating tools to keep patients motivated. These will be exchanged at future camps so that patients have new toys every 2 months. The first follow up camp was held on December 11, 2012 and focused on: consonant clusters, speech therapy, growth development and recreation. Speech therapy progress assessments were done and further home-based exercises were assigned. Northern Women Development Foundation (NWDF) staff also subsequently visited and observed Speech Assistants in different areas while they facilitated speech exercises. 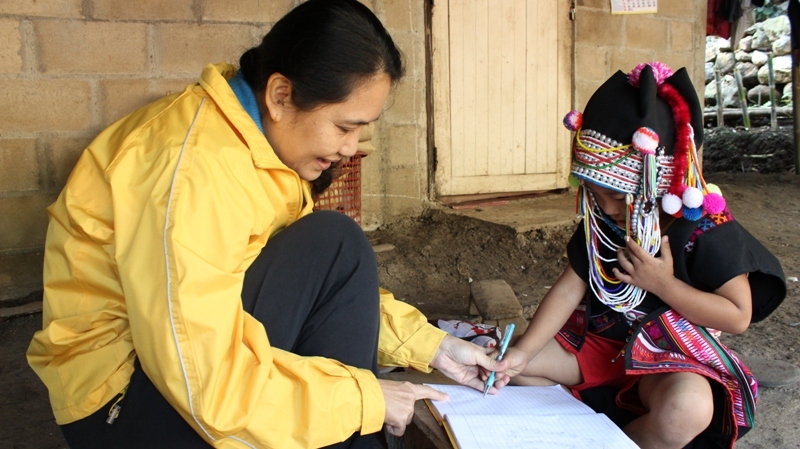 They visited 6 districts and speech language pathologists also visited a family from the Akha tribe. The Akha are an indigenous hill tribe that live in small villages at high altitudes.